SPOKANE VALLEY, Wash. - Brandon Snider still remembers what it felt like before his heart stopped beating. "My heart just started racing, and I knew something was wrong so I just pulled myself out and told someone to go in for me." 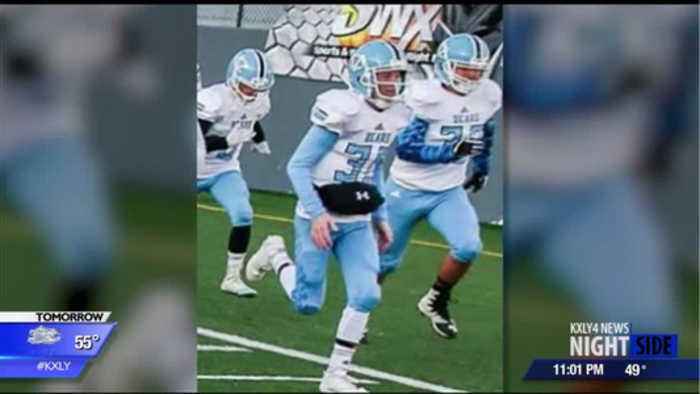 The 16-year-old Central Valley sophomore went into sudden cardiac arrest last fall during the third quarter of a football game. "He was looking right at me and all of a sudden I saw him go down, and I thought he was messing with me," said coach Romanus Chodorwski, who yelled for medial help and called 911. Travis Richardson, a SVFD Captain, was nearby and began tearing off Brandon's pads and jersey to start CPR. "What really saved him was the AED," Richardson said. That automatic external defibrillator was only a few yards away - and so was someone trained to use it. "For me it was the right place, right time, and right training," said athletic trainer Jeff Morrison, who administered the lifesaving AED. Morrison, Richardson, and Chodorwski all received a lifesaving award Monday from the Spokane Valley Fire Department. "These plaques, these aware ceremonies are great but - you know - just shaking (Brandon's) hand when he walks into my training room everyday is worth way more," Morrison said, holding back tears. Doctors say Brandon would not be alive today without the early CPR compressions and the portable defibrillator. "There's places in Spokane that these kids play that are not fully prepared, and it's scary to think about," Morrison said. He believes more AED devices need to be established throughout Spokane. "They are not expensive for what you get, and they need to be everywhere. People need to be trained on how to use them." Brandon can no longer play football, but he is on Central Valley's track and field team this spring, and is considering basketball next fall. "It's just crazy how they were all right there to help me," Brandon said.